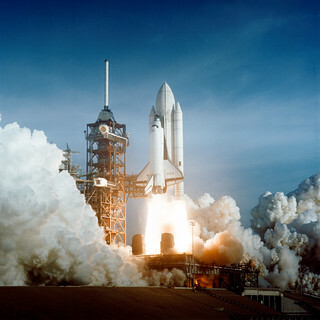 S81-30498 (12 April 1981) --- After six years of silence, the thunder of manned spaceflight is heard again, as the successful launch of the first space shuttle ushers in a new concept in utilization of space. The April 12, 1981 launch, at Pad 39A, just seconds past 7 a.m., carries astronaut John Young and Robert Crippen into an Earth-orbital mission scheduled to last for 54 hours, ending with unpowered landing at Edwards Air Force Base in California. STS-1, the first in a series of shuttle vehicles planned for the Space Transportation System, utilizes reusable launch and return components.